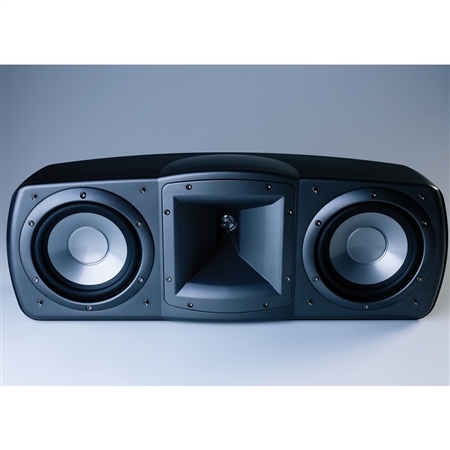 The C-3 is a two-way Tapered Array system that utilizes a pair of 6.5-inch magnetically shielded IMG woofers and a 1-inch magnetically shielded aluminum-dome tweeter coupled to a square Tractrix® Horn which increases sensitivity and minimizes room interactions that blur sonic detail. The C-3 offers bi-wire capabilities allowing the use of one or two speaker level inputs as desired for improved connectivity. Available in a black finish with titanium accents the contemporary look of the C-3 is two-fold. With its grille on the C-3 offers a sense of elegance that nicely blends in with your home décor but take the grille off and you get an aggressive and powerful statement that exudes extreme performance. The C-3 offers a seamless engaging soundstage that puts audiences in the middle of the action. By adding this center channel to your home theater system you will transform songs into live concerts and movies into lifelike adventures. While no longer in production the C-3 is still owned and listened to by Klipsch fans around the world. To connect with other people who are passionate about audio and interested in Klipsch products visit our open forum bulletin board.